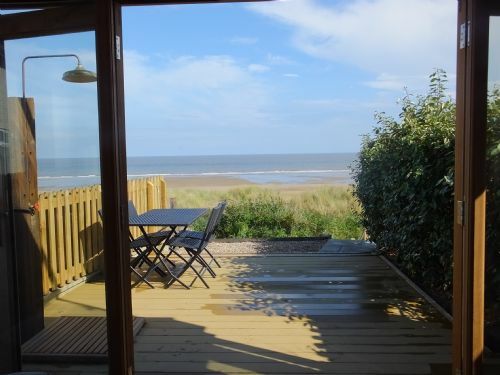 Beach Cottage sits on the ridge of sand dunes over looking the beach at Anderby Creek. My 14 year old son has autism and wanted to find a blue house holiday. The beach cottage was perfect. Wow, what an amazing beach cottage with wonderful views out to sea. So relaxing & peaceful. Had the perfect break here, the beach cottage had everything you would need & so warm & comfortable. Will definitely come back. Was so easy to book, thanks for the wine. Fabulous house with views to die for. Beach house is in a fantastic location, almost in the dunes. It has been thoughtfully furnished, it's well equipped, the lighting is great and the shower is fantastic. It's great for dogs as easy to sweep floors and direct access to the beach. The bedroom balcony allows you to see the sunrise over the sea without getting out of bed - hard to beat. It's a really special place. We stayed at Beach Cottage for the New Year and had the most relaxing, enjoyable stay - probably the best New Year yet. This is a beautiful cottage in a fantastic, get away from it all location. We stayed in the summer and decided it would be perfect for a winter break too. It wasn't really cold enough to need the log burner lit however we did it anyway and it further enhanced the lovely cozy feel of the place. Have got another week booked for the summer and next New Years too - it's that good! Thanks for sharing your beautiful cottage. A lovely beach cottage which is more spacious than the pictures indicate. Well equipped and the furniture arrangements on the ground floor are very versatile. The location is perfect with plenty of walks direct from the cottage. Don't let the time of year put you off, we visited in January and although chilly we made use of the outside shower. We actually managed to get our border collie under the outside shower due to the fact it was warm water, he hates water with a passion so this is a major step forward for him. We all (including the pooch) loved the beach and walked to Sandilands and back one chilly but sunny morning, there was hardly a soul about, probably due to the time of year. On two occasions we spotted baby seals which was an absolute delight and the binoculars in the cottage came in very handy for close up viewing. The wine was a lovely touch, but some milk in the fridge would have been welcome touch. Not a major issue but our only comment is that the cottage could do with a good clean, there are cobwebs everywhere and it was filthy behind the door in the bathroom, as I said its not a major issue to us but it's the attention to detail that counts when you are marketing such a lovely property. Also the towels provided were of excellent quality but like cardboard so I had to wash and tumble dry them before use. The most perfect Christmas hide-away and the best nights sleep we have had in a long time, huge comfy bed and nothing to hear but the lapping waves in the distance. The cottage is wonderful, comfortable and cozy and we will Definitley be going back there! I can’t think of anywhere else on the East Coast from the Wash to Spurn Head where there are houses with a sea view - Beach Cottage has fine panoramic views from both sitting room and bedroom. Combine this with a tasteful, clean and cosy interior and you can see why we want to come back again soon! Only spent Monday evening to Friday morning in this marvelous spot and was very sorry to leave. At this time of year to wake up to a vision of the sea rolling in and the sun rising is just magical. The cottage was lovely and warm and cozy with everything you would want for two (plus two little ones, which we didn't have!) but we had our little dog and she loved it too. We would love to return. Enjoyed Beach Cottage for the 3rd time last week and just wouldn't change a thing. Fully equipped and a week of total relaxation, doing nothing except reading, having long lazy lunches, and walking along the beach - exactly what we were looking for. Bottle of wine on arrival is a nice touch. Anyone staying at Beach Cottage will not be disappointed. Also booked for next October whilst we were there. As many have mentioned before us this property has a dream location-- beautiful views- A very comfortable dwelling-- With well equipped kitchen and lounge. Fantastic cottage - Beautiful setting! From the moment we walked in we knew we'd booked the right place! Amazing sea views from the open plan living area and upstairs bedroom. It was great to be able to relax on the balcony and feel like we were on the beach. A relaxing, comfortable and peaceful cottage in a great area. Plenty of walks from the cottage, so no need to go out in the car. We would highly recommend this place and we'd love to be able to go back! This was our 2nd stay at beach cottage & it definitely wont be our last, infact we will be rebooking for next year as soon as were home! We have travelled around the world & seen many beautiful places but beach cottage is our most favourite. It's a little piece of heaven right here on earth. See you again soon Beach Cottage. Sea outside the door we had beautiful weather so it doesn't get much better than that. We stayed at Beach Cottage as part of our honeymoon and absolutely loved it. Such a beautiful property - every detail is perfect & a lot of thought and care has gone into the design & layout. From the second we walked through the door we knew a long weekend wasn’t enough. The location is ideal just a stride over the sand dunes and onto the beach - it’s wonderful to sit on the decking or balcony & watch the world go by. Can’t wait to come back. I haven't been to Anderby Creek since I was 14. my family used to go there on a weekly basis but sadly when our caravan was destroyed in a storm we never went back, so there was a 56 year gap between visits! I was apprehensive about returning as Anderby Creek may have changed so much over the half century - but no, it was a wonderful trip down memory lane - everything, apart from the lack of breakwaters, was as i remembered it! The bonus was the gorgeous Beach Cottage that we stayed in. What a lovely little house, so beautifully updated and extended it was like a Californian beach house. The decoration and interior design were stunning. Beautiful furnishings and accessories and lovely bathroom and bedroom with its upstairs deck. We couldn't fault it. It was really emotional for me to go there, I have such happy childhood memories. I cannot praise it highly enough, well worth the money. The wine, flowers and milk were a lovely touch. All in all highly recommended. We had a very peaceful relaxing weekend at Beach Cottage in March 2018. It was really lovely to wake up to the view of the beach and be able to open the balcony doors and hear the sea. We would definitely like to return. Beach Cottage had everything we needed and we all even enjoyed a relax in the small slipper bath, not at the same time obviously!! Perfect location over looking the beach. Tastefully decorated and the log burner is nice for cosy nights in after an evening stroll on the beach. Be warned the steps to the property are very steep and not very well lit. Downstairs space referred to by the owners as "the beach room" is a wasted space; an addition of a larger TV and a comfy sofa in the space would be a far more comfortable and practical use of the space. The garden isn't completely secure. All of these niggles wouldn't put us of from staying again. Hopefully we'll be back. My husband and I stayed at Beach Cottage with our dog for 4 nights in January looking for some quiet time away. It was perfect. The cottage is equipped with everything you could need. It was warm and inviting in every way. The views of the beach from the cottage were the highlight for us, watching the sunrise and set was beautiful. The dog was happy to run straight out onto the beach into the sea every day and then return to the fire to dry off and sleep. We’ve returned rested and happy. Thank you. What else can i say but wow!!! We stayed here for a weekend break and before walking through the door we were stunned by the location. We entered the cottage and simultaneously said 'wow'. The cottage is beautifully decorated and the finishing touches are just prefect, and we especially appreciated the milk and wine on arrival. We had a quick look around the cottage before lingering on the 1st floor balcony with a glass of wine, listening to the waves crash on the beach 50 yards in front of us. Without doubt we will be returning here, what a lovely cottage, in a wonderful location providing such a perfect holiday, thank you so much. The cottage was in an amazing location and was in excellent condition. Bedrooms and bathrooms were extremely comfortable. There were some lovely extras provided like a bottle of wine and milk in the fridge. The comfort could only have been improved for a winter stay by a larger TV. However this is a minor detail and the cottage was overall excellent, extremely well equipped and just what we were looking for. It was also great to find somewhere so perfect where we could bring our dogs with us. This beautiful beach cottage is simply stunning. We have stayed at many holiday lets over the years, this place exceeded our expectations! So many thoughtful considerations in the design and dressing of the cottage. It's home from the moment you walk in. Excellent secluded location and cosy cottage, but cleanliness in terms of cobwebs and spiders needs to improve!! Our second stay here, enjoyed even more than the first. Booking is easy, information received before you arrive is excellent, and the cottage is just superb - equipped with everything that you might need and quality throughout. If walking along the beach, trips to the local pub for long lunches, and completely unwinding from your normal stresses are what you are looking for, then you will not stay anywhere better! Have booked again for next October during our break. This is a beautifully renovated cottage with every luxury you could need for your beach holiday. From first opening the door you see straight through the house to the sea and views from the upstairs terrace are sublime. We are local to the area and visit Anderby regularly with our spinger spaniel who accompanied us for our visit. We had lovely weather luckily and our 4 year old grandson stayed for one night. We were out on the beach digging at 7 am and he had a whale of a time! An amazing place in an unspoilt traditional part of Lincolnshire. A wonderful week beyond expectations with everchanging views of sea and sky. Fine weather added to the enjoyment and tranquility. A true opportunity to get away from it all and connect with peace and quiet. Do I really want to leave a good review so that other people book this cottage? No, I want to keep this treasure all to myself! We weren't blown away on the approach to the property, passing by a number of caravan parks, parking up on a patch of grass and making our way up uneven, overgrown steps. But before you even step into the cottage, you can see that spectacular view from the front door, all the way through to the beach. Wow. As soon as you're inside, you forget about your initial approach. In fact, we never left the property that way until it was time to leave. The property is clean, well-equipped, comfortable and stylish; we couldn't fault a single thing. The instructions/information you get when you book are clear and informative. There is almost nothing around you (i.e. shops, restaurants, people) and that's exactly what we wanted. This property defines 'getting away from it all'! We will definitely book again. Perfect location, we loved it that much we have already booked again for next year. Sunrise amazing views across the sea. Magical ! This cottage has everything you could possibly want, stunning views and lovely local walks. Nice and quiet location if you just want to get away from it all. It is furnished and decorated to a very high standard and I loved the attention to detail with the beach theme throughout. I can't wait to visit again and would highly recommend. The cottage offered quiet accommodation of a high standard, with wonderful restful views. A delightful find. A bonus was fabulous weather. Unfortunately, all this was really let down by the area, which was run down and shabby. The eateries were substandard and of poor quality. The right cottage in the wrong location. Thank you for taking the trouble to write a review after your stay at Beach Cottage. I am so glad you enjoyed the property. We appreciate your comments about parts of the area, it is something of a predicament. However immersing oneself in the cottage, the views and focusing on the beach and the sea hopefully allows other concerns to dissipate. As a matter of interest did you try the Fat Seagull, The Grange and Links and the Thai Restaurant at the Golf Course, which are all close by in Sandilands? The beach cottage is a hidden gem tucked away on the Anderby Creek terrace. Glorious views from the deck upstairs and the main lounge to enjoy whatever the weather. 5 star facilities and modern design makes your stay frel like a home from home. A special cottage in a special place. This place is a real gem. It has everything one needs when enjoying a relaxing break from comfortable beds, warm throughout. decent shower and kitchen. Comfortable lounge area with spectacular views from all angle's. Plenty of good walking routes. What a lovely place. Great views, total comfort and well worth a stay. I would recommend to friends and family. Whilst choosing a beach holiday in December may sound stupid we were blessed with very mild weather. This enabled us to use the beach daily whilst walking our dog along the miles and miles of un interrupted sandy shores. Whilst secluded the cottage provides a haven and is extremely well presented and the view from the main bedroom provides unparalleled views of perfect early morning sunrises. We would highly recommend this cottage but just one word of caution in that there are not many places to eat (for those that do not want to cook) save for the Fat Seagull which we enjoyed on two occasions and to which we walked to along the beach approx 3.5 miles. A big tanks to Emma also as the cottage is beautiful. We had a lovely relaxing time. The views from the house were amazing. It was peaceful and cosy. Clean and lovely a real find and a great place for a weekend. The cottage was cosy and warm. We were going to re book this cottage for November 2017 but we have noticed that the price has risen by 25% on this years price. We have therefore decided not to book this cottage next year. Whilst we feel that a price increase of some sort would be acceptable a 25 % increase in the present climate of low inflation is over the top. We had the most fabulous, cosy week relishing the luxurious interior of Beach Cottage plus enjoying many invigorating walks. Just what the doctor ordered! Excellent location and beautiful cottage. Very private, quiet and perfect for a relaxing break. Whatever the weather it's still the perfect place for a relaxing getaway. On arrival at the cottage it was clear that every little detail had been thought through, and that quality was a key component in the design and furnishing. Anything that you could possibly need for a short stay was provided. A wonderful location overlooking the beach - I doubt I could find anything more satisfying than opening either the upstairs or downstairs patio doors and just taking time out, no gizmos or gadgets, phones turned off, and enjoying the sound of the waves lapping up onto the beach. Enjoyed our weekend so much that we booked for next October whilst enjoying lunch in the local pub, but this time for a seven night stay. Beach Cottage is a portal to a better world of sea and sand, dogs and rabbits, and people who always say hello. The cottage is perfectly equipped and furnished for a relaxing break spent walking on the beach, or gazing at the constantly changing sea and sky. We wouldn't change a thing about it. From the moment you turn the key and open the door your love affair with this idyllic beach house begins . The view through to the glass frontage is of sea sand and sky, sublime. Quality fittings ,furnishings and bedding. Underfloor heating and log burner. The bedroom opens to a glass screened upper deck with even more spectacular views along the length of often deserted shore and dunes, We saw amazing dawns from our bed and a sea lit by the full moon . Very special. A huge thank you for providing the perfect location to celebrate an Anderby Creek wedding. The balcony has provided some amazing wedding photos. Beautiful little touches like the heart on the bed, amazing place! Perfect location, excellent quality accommodation and professional delivery. A week of walks and sunrises. Weather was kind to us considering it is late September. Everything was as it should be to provide us with a home from home. An experience we will treasure. Pleasant stay in couples retreat overlooking the sea at Anderby Creek. A beautifully appointed cottage facing the sea. Awake to glorious sunrises if you are lucky with the weather, which we were, only one day of rain all week. Sit on the upper or lower deck and watch the ever changing sky, or catch the afternoon/evening sun in the summer house watching wild rabbits playing below on the grass. A diamond in the rough as it is surrounded by rather run down properties and cafe/shop (for sale) near the beach. Hopefully this will improve as the potential is great. Long sandy beach for walks, a good place to come to read or write, relax and get away from it all. Unfortunately not a good area if you want to eat out except for the Fat Sea Gull a short drive away. Could not get a good coffee anywhere - all cafes have the machine but no one knows how to use them properly - which applies to most of the country unfortunately. The only let down with this delightful cottage was the state of the two cleaners (full bags/filters very smelly - had to clean them before use). Stainless steel saucepans (needed cleaning). Stainless steel frying pans (unusable until cleaned). Only a very worn scourer available. Kitchen scissors(didn't cut) and iron (base-plate worn) both needed replacing. Fry up had to wait until we went out and bought products to clean a frying pan and while we were at it cleaned the rest, so the following guests shouldn't have this problem. I am sure all this will be rectified as we filled out the form left for this purpose. A very delicious bottle of wine and milk in the fridge were provided and were very welcome after a long journey. If you like bird watching, Gibraltar Point Nature Reserve is worth a visit and has a good cafe. Lough and Alford were the two best towns nearby. Sutton on Sea has good fish & chips at Waldo's, a full to the brim antique shop Knickknacks and a good wool shop. The cottage is very well designed, the tub bath is fun and we enjoyed staying there. Thank you for submitting your review. I was very pleased to read that you enjoyed the 'get away from it all' experience which Anderby Creek offers, with all the benefits of nature at it's best. I can recommend The Grange and Links for good food and I am so glad you found the Fat Seagull, a favourite of our's too. We take on board your comment about the two hoovers and we will make a plan to rectify the smell, it can't have been very nice for you when you took the hoover out of the cupboard. I apologise also for the marks on the pans and thank you for the photos. We have been out and purchased some extra product to prevent this happening again - thank you so much for attending to them when you were supposed to be on holiday. The iron is only one year old but I clearly need to buy a better quality one. Thank you for all your feedback, most valuable. everything done to a very high standard.From walking into Beach cottage its like going into your own home.Emma &James seem to have thought of everything from the stressless chairs,which are exellent to the bottle of wine on the table when you arrive. Nick and myself have enjoyed numerous holiday's at Anderby Creek over the last 25/30 years.We became parents over this period and has know become a family favourite location.When we entered the Beach cottage,we all fell in love with the beautiful cottage.The renovation has been done to such a high standard.We went during the summer,however i do feel this stunning place could be enjoyed all year round.We have re-booked for next year.This has made our family holiday so much more enjoyable. Beach Cottage is such a lovely, beautiful place. We are a family of 3 plus a dog and we were very happy with our stay. The cottage has been thoughtfully designed/decorated and we found it to be exceptionally clean. The view out to sea is so relaxing, sitting in the stressless chairs with the french doors open or sitting out on the upstairs decking having a morning coffee, just perfect. One of the most beautiful places we have ever stayed. The house was stunning and a great place to relax. Great place for walking dogs on this unspoilt coastline. Would definitely recommend and would love to come back. Wow were the first words to spring from me on entering the property. The view the high standard of the property were all amazing. Ive traveled to some amazing places in my life abroad but this was spectualar and right on our door step! A very relaxing break! An absolutely stunning property in a beautiful setting. My Husband, 2 children, our dog and I had a wonderful time. We can't recommend the beach cottage enough, its such a special little place and we can't wait to return. Linda, Darren and Dave from Grimsby. We had a wonderful stay at the cottage - was in a perfect location for total relaxation and stunning views. Very good for walks with our puppy and beautiful sunrise. The cottage was to a very high standard and every detail was thought about to give you a comfortable stay. Will be making another visit and would recommend to friends and family. Everything has been thought of and provided. It has a superb location right on the beach and is so wonderfully designed. Recently refurbished to a very high standard, a few minor tweaks would make this an outstanding destination in every way. Hard to beat for tranquillity - at least at this time of the year. Had a 3 night stay in Beach Cottage and loved it. Perfectly positioned to take advantage of the beautiful views. Very well equipped and nicely furnished - the owners have done a fantastic job. The steps up to the cottage are pretty steep and probably not ideal for anybody with limited mobility - like our dog which is just recovering from surgery on her leg. But we managed with no harm done and would love to return when our pooch is a bit more mobile and can run freely on the beach. Would highly recommend. This is a lovely property which has everything you need and more. Very clean and comfortable. We had a great time with our two dogs. The beach is fabulous and dog friendly. Lovely shower and to fall asleep listening to the sea was amazing. The sun comes up over the sea and sets at the back of the property when you can sit in the little summer house in the afternoon sun. Just to mention the steps to the property and the internal stairs could cause problems for the elderly or less able. Beautiful house,high quality furnishings,gorgeous view but nestled amongst down at heel properties & a caravan park which let it down a bit.There was a shop on the caravan site to buy basics but a bit seedy,as was the cafe and bars nearby.We had bad weather, 40 mile an hour winds, sand storms and bleak skies, so not the best time ever. We are critical of the location facilities as this was our most expensive holiday let ever (£800), we felt that the property could've had a less luxurious finish and been cheaper to hire and would fit better with its surroundings. We were very comfortable there, however, it was warm and cosy, great to have a washer dryer, and a really comfy bed. Dear Mrs Dalton I am so thrilled that you enjoyed the quality of Beach Cottage. I am not sure I understood your reverse logic of lowering the refurbishment standard as this is not the route we normally take, but I will certainly ponder on it. I did read in your guest book entry that the weather was good at the start of your week, I am only sorry that it deteriorated after that, I am afraid that is England for you! As you chose to visit during half term week your rental price reflected this. We as owners and nearly all of our guests embrace the eclectic charm of Anderby Creek. It is all about simple pleasures, a walk on the beach, watching the waves, the clouds, the sunsets and the sunrises, appreciating the protected coastal park and maybe enjoying the odd plate of fish and chips. Beach Cottage has even been inspected by Alastair Sawday's Special Places to Stay and included on their website. I might point out that there are in fact two properties in Anderby Creek which have been awarded their badge and I believe this is not just for the properties themselves but also for the location. Great refurbishment! On arrival my husband and I and our 2 grandchildren were blown away with the the outstanding view as soon as we went through the front door. The decor was so inviting and relaxing. Loverly neutral nautical colours. The fixtures and fittings were to a very high spec. The children couldn't wait to check out upstairs and downstairs then left their unpacking until after they explored the sand dunes and the beach that was just metres away. There was everything you would need to cook a lovely meal. Plenty of crockery, cutlery, pots and pans and utensils! Most people dream of living by the sea! We did for a week and it was very enjoyable. Could have stayed there for the whole summer. Leading out from the bedroom was a large balcony with stunning views of the sand sea and sky. Delightful in every way. Can't wait to go back. Our stay was so peaceful, the view, the sound of the sea, the bird life going past the window, the open expanse of sand and dunes - all produced a feeling of well-being and relaxation. The accommodation could not have been more welcoming, the facilities could not have been better, and we felt thoroughly pampered and welcomed. The cottage takes full advantage of the location and the full height windows of the bedroom permit full sea views, even when you are in bed. People with limited mobility, e.g. who walk with a stick, should be aware that the internal stairs are quite steep, as are the steps from the parking area and from the beach. In all other respects the cottage is an absolute delight - we will be going again! Yet again another perfect stay in the beach cottage. Nice relaxing break doing nothing much more than walks on the beach and sitting by the log burner. Will definitely be back ..!! Review of Beach Cottage Anderby Creek.A short break in February. We had a fantastic break at Anderby Creek.The cottage is well equipped and comfortable with stunning views straight over the beach to the sea.Just such a wonderful unspoiled location with amazing sunrises, sunsets and starlit nights The cottage has been renovated with a great deal of care and thought and the huge French windows, both upstairs and downstairs make the most of the light and the vast panoramic views .It is almost like the outside and the inside merge so that you really feel aware of all of the nuances that are happening with the weather whilst tucked up cosily in the cottage. and of course, when it's warm, you just open the French windows and the inside of the cottage and the great outside become one. There are fantastic patios both upstairs and downstairs to sit, have breakfast, sip tea and just chill.I have recommended this cottage to all of my friends and family. We had an amazing time. The cottage is perfect, very comfortable, cosy and the interior works very well. The sunrise in the morning was spectacular and the walks along the beach were really nice. The weather was a little grey but it didn't spoil anything. it just made us want to come back in the summer when the sun is shining! Cosy cottage with most amazing coastal views. Loved this cottage for a short winter break with my dog. Fantastic views from lower and upper levels. All the mod cons for cooking, living and relaxing. Comfortable and tasteful furnishings with all the amenities you would want during a short or longer stay. Really looked forward to coming back to such a cosy place after long walks, especially when weather very cold, and log burner in place as well as very efficient heating throughout the property. Would definitely recommend to anyone looking for a peaceful and relaxing break. Would like to experience in summer as location perfect for numerous walks and sightseeing opportunities. What can we stay. It was fantastic. Grest views and so comfortable. Didn't want to go home! The location was perfect, and the cottage was so comfortable you didnt want to move. Great walks on the beach and back for chocolate. A great stay, will be back. We stayed at the cottage for a weekend, during our stay it was the first cold spell and storm of the winter. It was very comfortable and the views out to sea were stunning. We enjoyed walks on the beach and the peace and quiet. Brilliant in every way ..!!! Beautifully furnished , so cosy and right on the beach . What more could you want or need. Booked to come back again ..!!!!!! Loved our 3 nights at Beach Cottage. The cottage is very well equipped and very comfortable. The views of the beach and ocean from the comfort of your chair are superb! We found it one of the warmest lets we have ever stayed in and it was very quiet. Our five year old dog is very frightened of fireworks but loves the beach, so she was very happy that no loud bangs at Anderby Creek! We will be booking again very soon. Very impressed with the effort made, seemingly everything was thought of. Great location facing the beach, with wonderful views. Perfect relaxing weekend, would definitely recommend the cottage to anyone. Thank you. Thoroughly enjoyed the lovely beach cottage - the cottage fixtures and fittings, the views and for us the weather were excellent. We spent hours on the upstairs decking watching the beach and enjoying the sun! The cottage was always warm and comfortable. As the cottage was so new, broad band wasn't available for our visit and the phone signal is very variable - am dreading my next phone bill!! We also recommended a fan for upstairs as it is a very warm cottage which will be great for winter breaks but will be needed for summer!! Have already recommended the cottage to friends who saw pics of this beautiful cottage on FB and asked for the details!! Also plan to return ourselves!